How does that tiresome dirge go again? "Shoulder to shoulder, we'll answer Ireland's Call." He is a tough boy, Robbie Henshaw. You see it in his demeanour on the field. I don't think anyone actually enjoys tackling, but some people just garner an aptitude for it. You deal with the impact of every collision even if the last one really hurt you. The tough ones get up, quickly go about their business and look for the next opportunity to smash someone. When Henshaw hurt his shoulder while scoring his second try against Italy last Saturday, the distress was evident and obvious. It was a serious injury from the moment he dotted down. We, as spectators, have become conditioned to seeing our players suffering serious injury. It is a very common occurrence. The longer the delay, the louder the applause as they wheel him off - the more serious the injury. No sooner is the player in the medical room when attention turns to who is on to replace him and whose scrum is it? The King is dead, long live the King. When the match is over - pints, more pints and then bed. When you wake up your head may be sore but it will be clear in an hour or two. Henshaw's pain would be continuous. Oxygen to help you get off the field. They have to cut the jersey off you. They probably have to cut the protective brace that you wear as well. The claustrophobia of the MRI tunnel is nothing to the operating table. A two-hour procedure and discomfort and pain for the next month and more. You can't even sleep properly with an A/C joint repair. The real pain then starts when you begin a 16-week rehab. The loneliness and solitude of the injured player - rehab is worse than the pain of the injury. Bad luck to do it once - but twice in the space of a year, that will test your spirit and resolve. Henshaw, lest we forget, suffered a pectoral avulsion on the same shoulder while playing for the Lions against the Hurricanes last summer. Being sent home injured from a Lions tour must be a dispiriting and soul-emptying experience. It's a different type of surgery when you tear your pectoral muscle from your clavicle but the pain and demoralising borstal of rehab wouldn't differ much from the task ahead of him now. Would the Lions injury have played a part in the injury he suffered last Saturday? Hard to know. Let's just say that it is quite possible that Henshaw could be rehabbing his right shoulder for the rest of his career. The amount of scarred tissue and surgical correction would leave his shoulder vulnerable. A special weights programme allied to a flexibility/pliability routine will be required …forever. The injury was a little unlucky. Henshaw scored Ireland's first try and had to take the impact of his fall on his right elbow with the ball in his left hand. He did get over unmolested by any Italian. In scoring his second and Ireland's fifth, Henshaw did not have the luxury of an unhindered passage to the line as Tommaso Benvenuti chased him down all the way to the line. Henshaw tried to fend him twice but to no avail and as the line approached he did not have any choice about how the ball would be dotted down. Normally, if you are able to, you can adopt the correct way to score. Run low to the ground as the line approaches, stick your left arm out in front of you and carry the ball in your right arm and begin the act of diving two metres from the line. Henshaw had a determined defender on him as he approached the line and as he went over he broke his fall with his ball-carrying arm. His elbow hit the ground just as Benvenuti landed on him and you could see the joint pop. He never had time to break his fall or the ball in correct hand or the chance to change the angle of his fall. Henshaw's memorable try against the All Blacks in Chicago was not a thing of beauty either - it didn't really matter. The point is that some players know how to place the ball, some players know how to protect themselves in the act of scoring. This one was just one of those things. Henshaw's partner for Leinster and Ireland Garry Ringrose has also had some major problems with his shoulders. 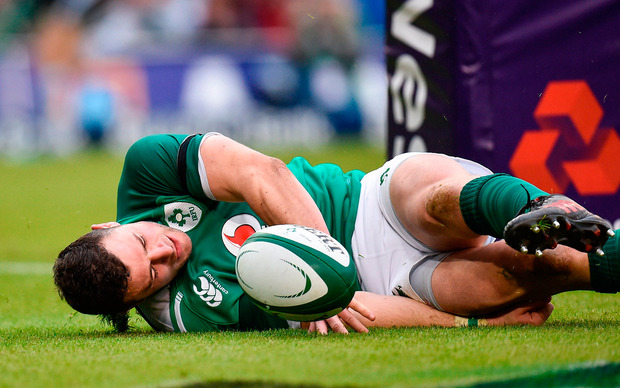 Although it is an ankle problem which will prevent him from replacing Henshaw, it is a precarious position to be in where both of your first-choice centres now have shoulder issues in a theatre where they are tasked with taking down speeding cars. Ringrose's shoulder problems are not dissimilar to Henshaw's and corrective surgery on both of them during the summer was an imperative. Five months out and suddenly he should be thrown in against the Welsh. You could be damned sure that if George North were fit and Ireland picked Ringrose in the centre, they would be sending the huge Welshman in off his wing just to see if the boy was up to it. Jared Payne hasn't played since June 20 and there's no sign of a return so our midfield looks bare. Currently the international stock of centres looks really lean. France lost Fofana again to serious injury and Bastareaud is out of favour. The French chose Lamerat and Doumaryou - my God, the Stan and Ollie of French centres. Hadleigh Parkes and Scott Williams looked what they are against England - Pro14 players. Huw Jones and Peter Horne are not exactly Butch Cassidy and the Sundance Kid but they were competent against France. We will get a better idea when they play against Owen Farrell and Jonathan Joseph who are probably the best of an average lot. Chris Farrell is someone I was very unsure of. During the October and November period, I watched Farrell to see what he was good at. I thought that the guy couldn't pass. There were a series of matches where the ball just didn't get passed anywhere close to where it was supposed to go. I am assured that Farrell is not only a good passer but he is smart and a good footballer. He is just about our fifth-choice centre but the headmaster has put some time, effort and interest into him and his efforts in November will stand to him. Offensively Ireland should do ok. It is just that in the outfield I am not full of confidence that when the pressure comes on that we have a cabal of defensive strong men who will do the right thing at the right time. Payne and Henshaw are a huge loss - Ringrose too. A huge amount is now expected of our midfield, particularly without the ball. Henshaw's loss hugely destabilises our midfield's equilibrium and his defensive nous and work ethic is practically irreplaceable. For those charged with trying to cover for him - Head up, chest out, shoulder to shoulder we'll answer Ireland's call.